Health related conditions and Chiropractic care. Read moreCan CCSVI Treatment Cure Multiple Sclerosis? Today you can watch an anatomy video showing some of the your back bone spinal anatomy including the curvatures of the spine. These spinal curvatures include the vertebrae of the cervical, thoracic and lumbar spine. You will get to see how the 33 spinal vertebrae that make up your back bone connect to each other through spinal joints called, facet joints. Not only does each vertebrae connect to the spinal bone above and below through facet joints, but also a inter-vertebral disc. To help keep all these spinal structures in place are very strong ligaments like the surpaspinal ligament. So watch the spinal anatomy video below to learn more about your back today. Read moreWhat is a Pulled Muscle? A lot of people in the UK and around the world suffer headaches on a daily basis. Most of these headaches are the new neurological symptom commonly seen by general practitioners and neurologists in the UK¹. Thankfully cluster headaches are not a common headache to experience by most. Cluster headaches were termed the ‘suicide headache’ by American neurologist Dr. Bayard Horton. Remember though a cluster headache is not a migraine headache. So read on to find out more about cluster headaches. I came across a health article in the wall street journal online’s opinion section today commentating on US President Obama’s recent remark asking whether children should be given a tonsillectomy for a sore throat infection (a.k.a tonsillitis). Why would Obama says this you may ask? President Obama made the remark at a press conference¹ “You come in and you’ve got a bad sore throat, or your child has a bad sore throat or has repeated sore throats,” President Obama explained further saying “The doctor may look at the reimbursement system and say to himself, ‘You know what? I make a lot more money if I take this kid’s tonsils out” So the president of the USA has asked the question should your child have their tonsils taken out? Research studies suggest that back pain will affect as many as 4 out of 5 people in the UK. That is 80% of the British population! This results in 4.5 million days off work a year. So with 80% of adults having a chance of a lower back pain episode at some stage during their life, back pain is pretty much a guaranteed condition. Pain in your lower back can affect a persons health drastically. It is a leading cause why people seek Chiropractic treatment from a chiropractor in their area. Did you know your local chiropractor can help treat lower back pains and can provide you with some lower back pain relief, spinal exercises and other helpful advice so that you can manage a chronic low back or an acute lower back episode? 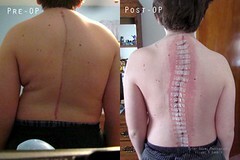 Read moreWhat is Scoliosis of the Spine?